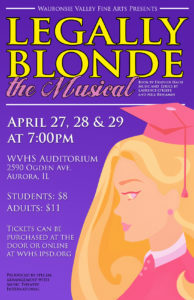 The spring musical has once again arrived, as Waubonsie Valley Fine Arts presents Legally Blonde the Musical April 27-29. Written by Heather Hach, Legally Blonde follows the story of Elle Woods, a sorority girl who enrolls at Harvard Law School, in order to win back her ex-boyfriend. Music and lyrics are by Laurence O’Keefe and Nell Benjamin. Tickets are $8.00 for students and $11.00 for adults. Performances begin at 7:00 p.m. in the Waubonsie Valley Auditorium. Tickets may be purchased at the WV Box Office or at Seat Yourself. For more information, e-mail wv_box_office@ipsd.org.